10 Feb A gourmet food tour in Lima, the food capital of South America! 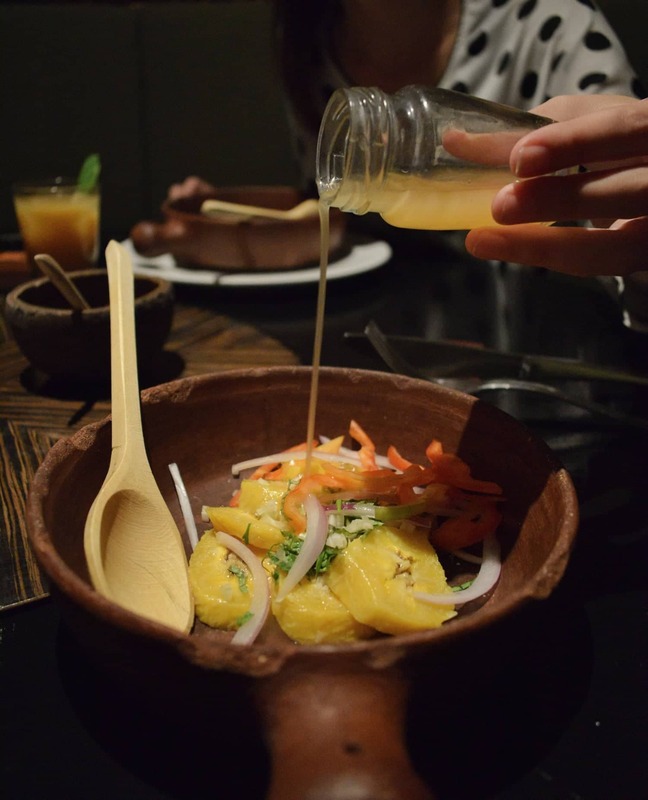 Lima, the chaotic capital of Peru, is considered to be one of the top culinary destinations in the world. The main reason why we visited Lima it was to try its unique tastes, to visit some of the top restaurants in South America and of course to discover how Peruvians have managed to combine the various cuisines of the world. Our trip to Peru was full of adventurous experiences but with a relatively limited time (this happens to those who cannot resist to an adventure! ), we decided to explore the flavors through a gourmet food tour in Lima! We experimented, tasted and visited some of Lima’s finest restaurants in an afternoon with the “Lima Gourmet Company“. And let us tell you…it was a pure joy! Let’s start with a Pisco Sour Cocktail (because no great story ever started with salad!). The time was 04.30 in the afternoon when Kimberly, our terrific “culinary guide”, met us at the hotel to start the 5-hour food tour in Lima. She led us to the company’s van and we found ourselves at the first stop of the tour. By the sea, in an idyllic restaurant a barman was waiting for us in order to show us how to make the ultimate Peruvian cocktail, Pisco Sour! Pisco is a drink, transparent and strong (48% alcohol), like our own good Greek raki, made from grapes coming from five specific regions of Peru. This drink is used as a base for various blends. The most famous, Pisco Sour, is a blend of Pisco, lime juice, egg whites, syrup and bitters. After the demonstration we had the chance to enjoy our cocktail with Kimberly and talk about the Peruvians flavors and life in Peru. A nice introduction to our pleasant experience! The exciting flavors of the Amazon. After the Pisco Sour cocktail our appetite was “on fire”! The introduction in the Peruvian flavors was going to be impressive. Peru is a country with many different climates and great diversity on its soil and products. On our trip we visited the impressive Amazon, a significant piece of Peru. Before our visit, however, as part of our food tour in Lima, we found ourselves in another “Amazon”, the “Amaz” restaurant. It is one of the best restaurants in town with cuisine and ingredients from the Amazon rainforest. There, we had the opportunity to taste unique flavors, as well as to make our own cebiche with plantains (delicious!). We tasted Peru’s hottest peppers, while we drank our second cocktail made from Amazon fruits that we didn’t even know that existed. Our favorite dish (we tried quite a few!) was the marinated chicken skewers. The tasting experience was accompanied with the explanations of our guide, Kimberly. Her company and the information about everything we tasted made the whole experience even more interesting. Dinner overlooking the Huaca Pucllana pyramid. After the exotic Amazon cuisine, the food tour in Lima had another surprise for us. Dinner with the view of Huaca Pucllana pyramid, which is dating back to the pre-Incan era. At this privileged spot is the Huaca Pucllana restaurant, which offers a more luxurious sense. This was also the last salty part of our tour. So, after discussing with Kimberly about what we want to try, we decided to taste some more extraordinary dishes for us (but also traditional ones), such as calf heart and cuy (guinea pig). The truth is that cuy didn’t manage to get in our “favorite dishes list” but it’s worth testing, because if you come to Peru you have to do it their way! We finished the dinner with a variety of desserts, the majority of which had traditional Peruvian ingredients such as quinoa. Yummy! Wondering into Lima’s most hip neighborhood, Barranco. The Peruvian flavors were more than satisfying. However, we were so full after all those temptations, so a walk in the most vibrant neighborhood of the city was an excellent idea. Of course, in the end we were tempted by Kimbely, who took us to a cute ice cream parlor with excellent ice cream. What to do…we couldn’t resist! The music in the corners of Barranco, the crowd and all the energy of the neighborhood was what it took to close a great night and a “must do” food tour in Lima. A few words about the “Lima Gourmet Company”. The specific Food tour in Lima was the Evening one. The company also offers a Day food tour with a different program, cooking classes and other interesting activities! The service and the food tour itself were excellent, the same as guide Kimberly. Note: We were guests at The Lima Gourmet Company and this is a review based on our personal opinion and experience as always. We want to thank the company for the great service & experience.